Two German Type IX U-Boats are meeting far away from Germany in the tropical South Seas. Type IX U-boat class (180 boats). Type: Submarine, German U boats. The big sister of the German U boats Type VII was the Type IX U-boat class which had a greater range and better habitability. It was designed for operations in distant waters and possessed good seakeeping qualities. The first boat, U37, was commissioned in August 1938 only three months after being launched. The Type IX B built shortly afterwards carried an extra 11 tons of fuel. The Types IX C and IX C-40, which differed only slightly from each other, again increased the fuel capacity and range of the boats. Contracts for some of these boats were cancelled in 1944 in order to concentrate production on the new Type XXI . U511 was handed over to Japan in 1943 and became the RO500; U1224 similarly became RO501 in 1944, but was sunk north-west of the Cape Verde Islands by a US destroyer while on passage to Japan. 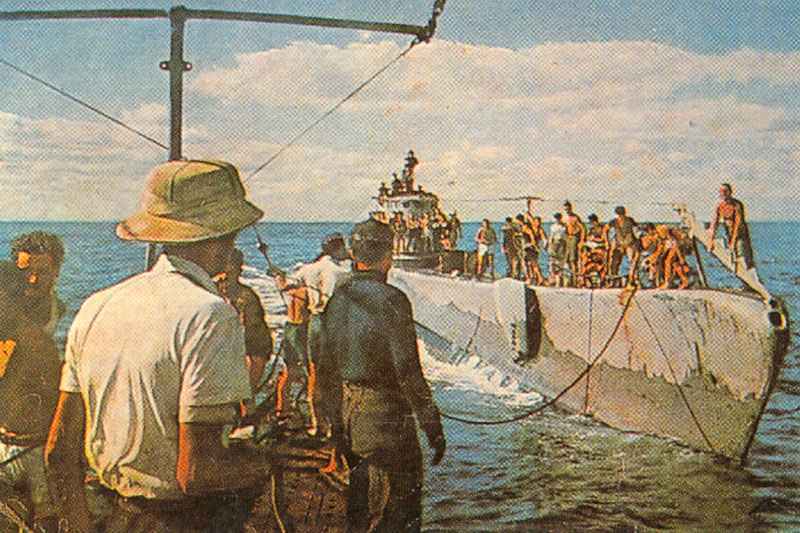 As the Allied blockade on Germany tightened there arose a requirement for a submarine to carry small cargoes of vital materials from the Far East to Germany. The Type IX C design was therefore modified by being lengthened by 7.6 m (25 ft) and given a cargo capacity of 252 tons. The Type IX D-41 which resulted sacrificed all its own torpedo armament and some of its battery capacity to achieve this while a later version, the Type IX D-42, reverted to having its own torpedo armament. This last series of boats may be regarded as the final series of the conventional submarine to join the German navy. Apart from its ability to carry vital cargo from the Far East it also had the greatest range of any German submarine of over 31,500 nautical miles. U195 was transferred to Japan as I506, while U181 and U862 became the I501 and the I502. A U-boat from Type IX B is leaving a port in France. U-124 from Type IX B, the big sister of the Type VII. Between 1938 and 1944 180 U-boats of this class were build. 142 of them were lost in WW2. Since mid-1943 the submarines came under increased air strikes: here the anti-aircraft gun crew of U-848 (Type IX D-42) is going in cover under the fire of an American plane which attacks the U-boat southwest of Ascension in November 1943. ‘Someone talked !’ British WW2 poster. A small number of Type X B submarines were built as large ocean-going minelayers, the Type X A never having left the drawing board. The mines were stowed in six internal mine chutes aft of the forward torpedo tubes, three mines in each chute, and two mines in each of 24 external chutes arranged either side of the beat amidships. Torpedo reloads were stowed both internally and externally. The boats had a range in excess of 14,000 nautical miles, and they were later increasingly used for cargo-carrying missions. U219 was in Penang at the time of the German surrender and was captured by the Japanese who renumbered her I505. The Type XIV were tanker U-Boats derived from the Type VII C. They were used to supply fuel to ether submarines to increase their time on patrol, and for this purpose they carried an additional 203 tons of fuel. They had no torpedo tubes of their own though they carried four torpedoes for transfer to other boats. Tagged 1939, germany, kriegsmarine, subs.